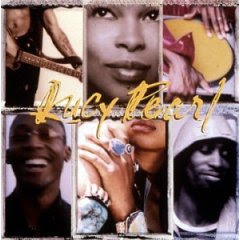 Old School Flashback: Lucy Pearl | BlackRadioIsBack.com - Official Blog of the Syndicated FuseBox Radio Broadcast! Back in the day (it is weird to reference the late 1990s as "back in the day"), this group sounded like one of the most random a** pairing of folks in the world - Ali Shaheed Muhammad (the quiet dude in A Tribe Called Quest), Dawn Robinson from En Vogue (and later on, Joi) and Raphael Saadiq from Tony Toni Tone forming a soul supergroup crew with a weird name - Lucy Pearl. Luckily, what sounded like it was good on paper was actually good on record (literally just the one self-titled Lucy Pearl album) as well (let us all remember the "eh" feeling folks got with projects like The Firm, Jay-Z/R-Kelly Best of Both Worlds action, Canibus not doing just battle rhymes, etc.). I still bump that album every once in a minute straight through - besides what I assume were regular possible group issues/folks getting tired of the project, they had that thing where the singles were so fire that some folks didn't really pay much attention to the other output that was going on with them - maybe the group would have lasted a bit longer. But, such is life.